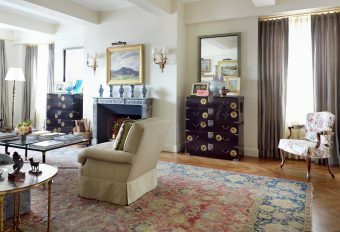 This apartment overlooking Central Park has a rich inheritance. 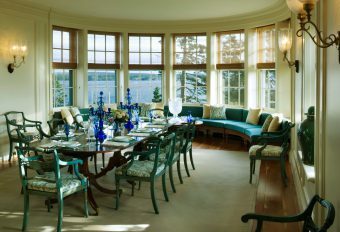 Donald Oenslager, the clients’ uncle, first decorated the rooms in the early 1960s. 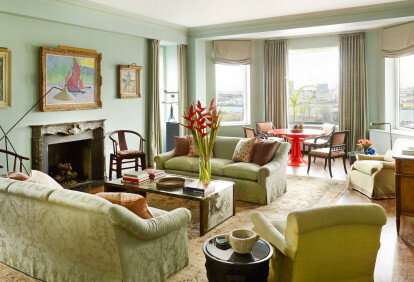 A Tony Award–winning set designer known for his famous designs for Anything Goes, A Majority of One, and Major Barbara, among other productions, he guided the decor of this apartment’s public rooms with rich color schemes and arrangements. 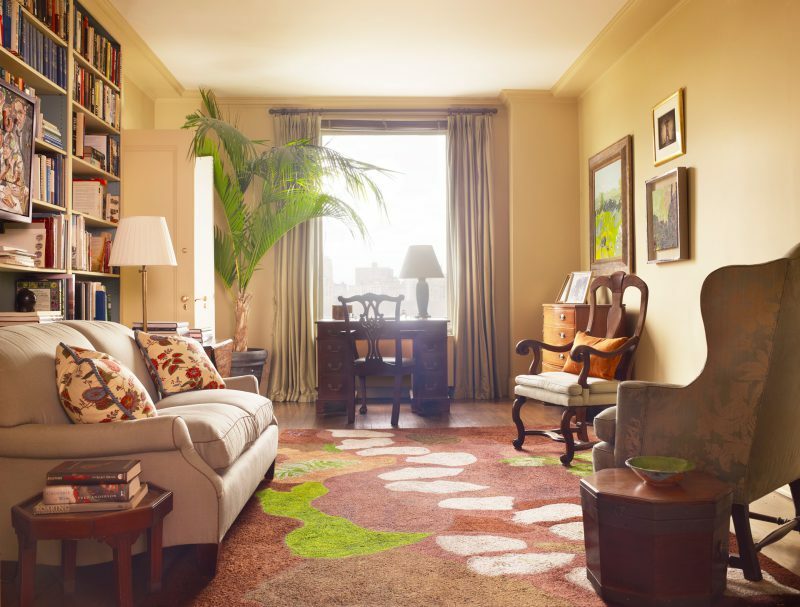 Later on, these brilliantly highlighted the family’s eclectic collection of American paintings and antiques as well as the remarkable hooked rugs made by the patriarch of the household, a hobby that he developed as an aid to quitting smoking while he watched football games on television. 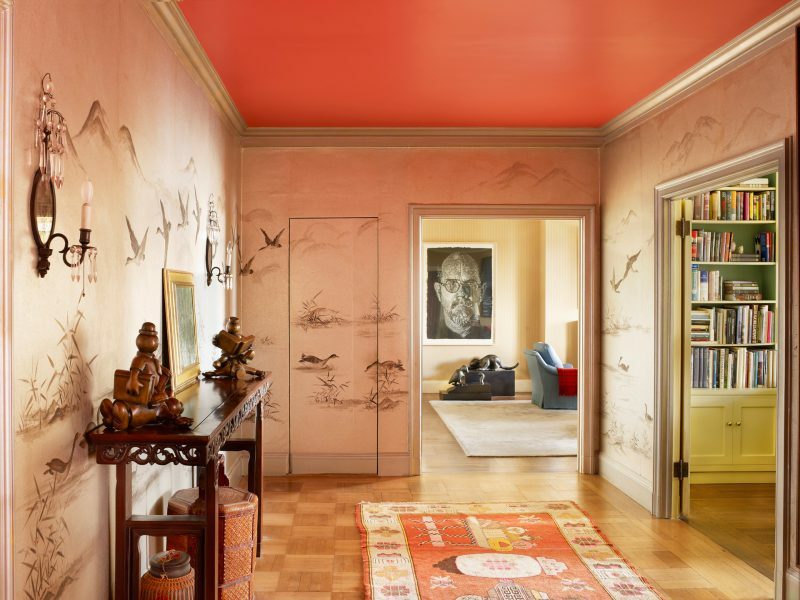 In the front hall, Oenslager installed Chinese paper on an aluminum ground with a ceiling stippled in shades of orange. 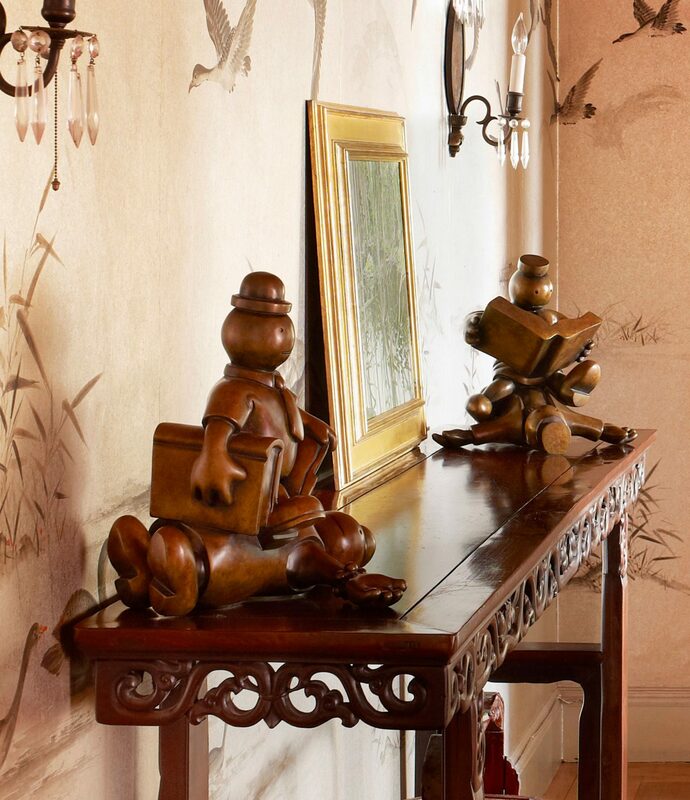 Our changes are subtle– touching up the paint and arranging several pieces of a series of sculptures by Tom Otterness on a Chinese table, a preamble to the collections displayed throughout the apartment. 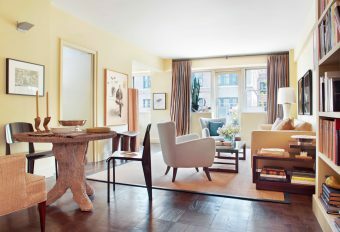 For the first few years we worked on this apartment, we made it a priority to conserve and repair the living room, especially the vintage Jack Lenor Larsen furnishings. 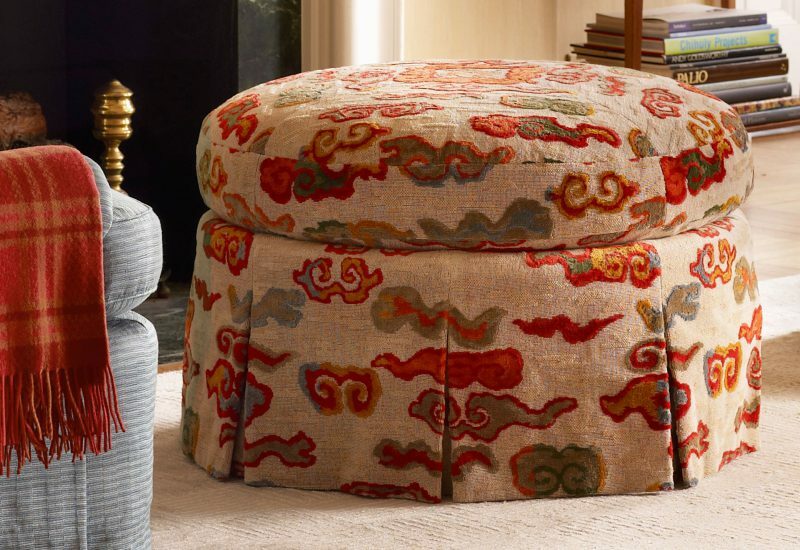 When these fabrics wore out, we developed a new scheme, also in blue silk, and added as a counterpoint an Asian fabric in a tapestry weave on an ottoman. 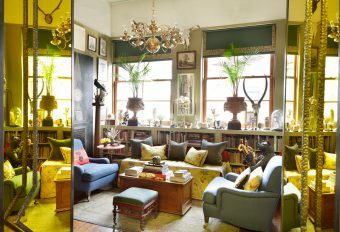 While it is more colorful than the Larsen fabrics, it plays well with contemporary art recently added to the collection. 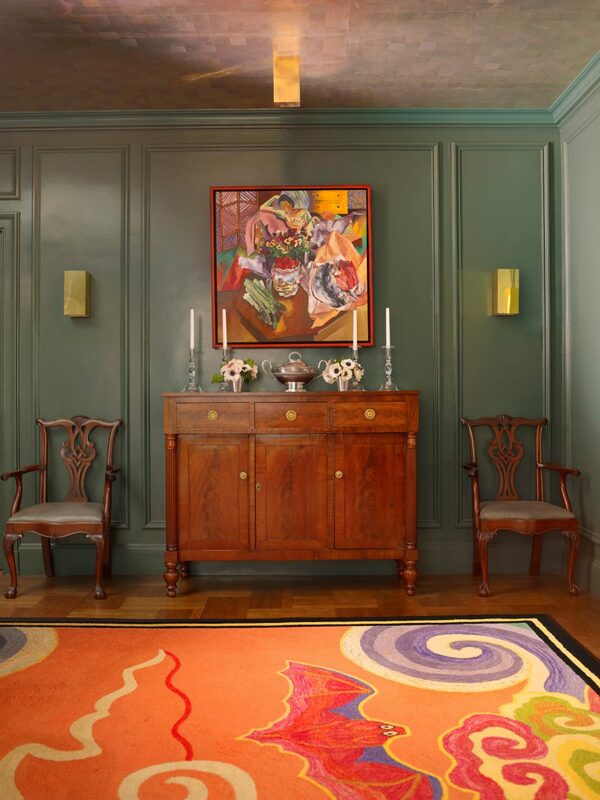 There is a new carpet of blue-green silk and the walls are covered in a beige stripe. 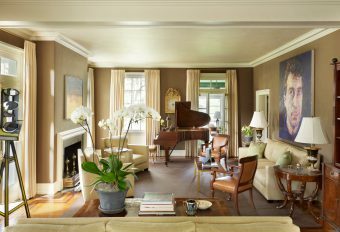 A Stuart Davis painting of Greenwich Village hangs above the fireplace in the living room. Mirrored window reveals expand the views and light, a popular device in apartments overlooking Central Park. 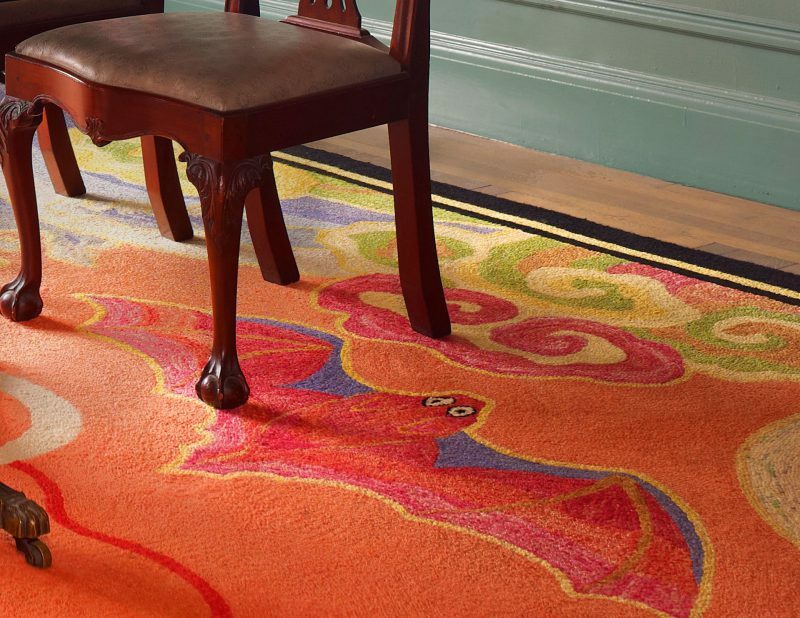 In the library, the carpet is based on a Japanese moss garden and formed the basis for the new fabrics. The furniture plan is open, in part because the room is used in so many ways, but mainly to display the carpet’s handsome design. 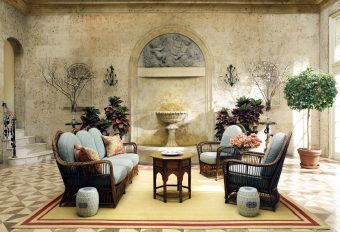 We added comfortable new upholstered furniture to the existing collection of European and American decorative arts. 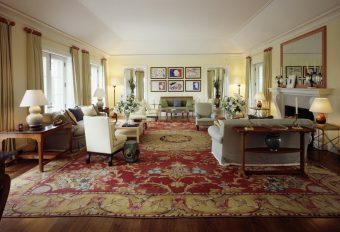 The carpet design in the dining room is based on Chinese fabrics with bat motifs and was also executed by our client. 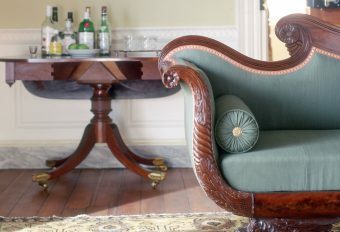 The Chippendale chairs are covered in embossed leather. We adjusted the green of the walls to complement the warm palette of the painting and a large sculpture by Dale Chihuly. 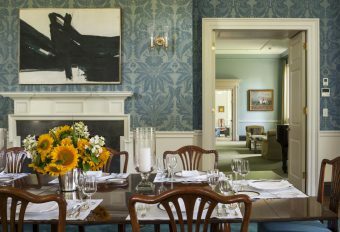 The dining room retains the applied moldings typical of the 1920s, when this building was constructed; the ceiling, covered in gold tea paper first installed in the 1960s, was recently restored. 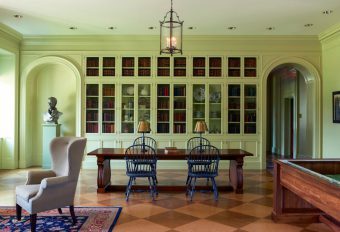 A painting by Anne Abrams hangs above a New England sideboard from the first half of the 19th century. A detail of Tom Otterness’ sculptures in the entry hall. Best known for his public work, his style is often described as cartoonish and cheerful, but also political.